TORONTO, Sept. 17, 2018 /CNW/ - Denison Mines Corp. ("Denison" or the "Company") (DML: TSX, DNN: NYSE American) is pleased to report a new discovery of uranium mineralization on the Company's Waterbury Lake project, located in the infrastructure rich eastern portion of the Athabasca Basin region in northern Saskatchewan. Basement-hosted uranium mineralization was intersected in two drill holes, approximately three kilometres northeast of the project's Huskie zone, returning mineralized assay intervals of 0.43% U3O8 over 1.0 metre (including 0.73% U3O8 over 0.5 metres) in drill hole WAT18-478 and 0.45% U3O8 over 0.5 metre as well as 0.31% U3O8 over 0.5 metre and 0.20% U3O8 over 0.5 metre in drill hole WAT18-479. View PDF version. The two drill holes were completed as a fence and were designed to test the intersection of the interpreted regional Midwest structure with the conductive GB trend. The mineralization is contained within a 60 to 80 metre wide package of highly structured and strongly altered graphitic basement rocks, which remains open along strike to the northwest and southeast. Additional targets exist along the interpreted Midwest structure, notably to the south at the intersection with the uranium-bearing Oban trend. Dale Verran, Denison's Vice President Exploration, commented, "These drill holes were designed as an initial test of a geological concept – that high-grade uranium mineralization occurs at the intersection of the interpreted regional Midwest structure with cross-cutting, graphite-bearing, structural corridors, as evidenced by the occurrence of the J Zone and Roughrider deposits and the Huskie zone. We are very encouraged by these early results along the GB trend, which has validated the concept by identifying a mineralized system in proximity to the interpreted structural intersection. We look forward to following up on these results with further drilling, and the potential to discover high-grades along strike at GB or along the mineralized Oban trend." Further details of the summer 2018 exploration program are provided below and in Figures 1 and 2. Figure 1: Summary plan map of the summer 2018 exploration program related to the Midwest regional structure. Figure 2: Summary plan map of the GB and Oban trends. The summer 2018 exploration program at Waterbury Lake commenced in late-July and included 3,315 metres of diamond drilling in seven completed holes. The program was focused on drill testing regional exploration targets related to the interpreted Midwest structure and additional step-out drilling down-dip and up-dip of the Huskie zone. 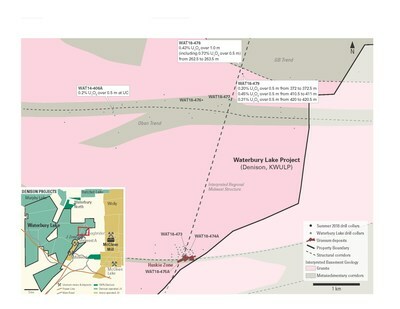 An initial DCIP resistivity survey is planned for mid-September to map the potential extension of the Midwest structure on to the Waterbury Lake property to the southwest of the Midwest Main deposit (25.17% Denison-owned) – with the possibility of defining drill targets for future testing. Summer 2018 drill target areas and the location of the DCIP resistivity grid are shown in Figure 1. A total of four holes were completed on regional targets approximately 2.5 to 3.0 kilometres to the northeast of the Huskie zone, where the regionally interpreted Midwest structure is projected to intersect the geologically favourable GB and Oban trends. Figure 2 provides a summary map of the drilling completed along the GB and Oban trends. 0.43% U3O8 over 1.0 metre (including 0.73% U3O8 over 0.5 metre) from 262.5 to 263.5 metres in drill hole WAT18-478. 0.20% U3O8 over 0.5 metre from 372.0 to 372.5 metres, 0.45% U3O8 over 0.5 metre from 410.5 to 411.0 metres and 0.31% U3O8 over 0.5 metre from 420.0 to 420.5 metres in drill hole WAT18-479. Drill hole WAT18-478 and WAT18-479 were drilled on an azimuth of 0 degrees with dips of -72 degrees and -74 degrees, respectively. True thickness of the mineralization is estimated at approximately 70% of the intersection lengths. The sub-Athabasca unconformity was intersected at approximately 200 vertically below surface in both holes. A broad package of graphitic metasediments, 60 to 80 metres in true width, which has undergone extensive brittle faulting. The faulting is typically coincident with the foliation of the graphitic metasediments which strike east-west and dip moderately to steeply to the south; with cross-cutting breccia zones interpreted to represent structures associated with the regionally interpreted Midwest structure. Strong clay alteration indicating the presence of extensive hydrothermal fluid movement. In addition, the faulting and alteration identified in the basal sandstone in WAT18-478, along with a possible unconformity offset to the north, suggest a compelling target at the unconformity at the up-dip projection of the basement mineralization intersected. The two regional holes designed to test the Oban trend as part of the summer 2018 program are interpreted to have tested outside of the intersection of the Oban trend and the Midwest structural zone. A compelling basement target still exists on the Oban trend approximately 800 metres to the south of drill holes WAT18-478 and WAT18-479. 4.5% U3O8 over 6.0 metres (including 5.8% U3O8 over 4.5 metres) in drill hole WAT18-452 (see Denison's press release dated April 25, 2018). A total of three drill holes were completed as part of the summer 2018 program, with targets located both up-dip and down-dip of the known mineralization with a view to test for high-grade extensions related to the northeast striking, cross-cutting faults. Drill hole WAT18-475A, completed as a 50 metre step up-dip of the know mineralization, intersected 0.12% eU3O8 over 1.0 metre from 277.5 metres and 0.15% eU3O8 over 1.0 metre from 285.5 metres. Due to core loss, the interval is reported as radiometric equivalent U3O8 ("eU3O8") derived from a calibrated total gamma downhole probe. The mineralization intersected by WAT18-475A appeared as disseminations of uraninite (pitchblende) contained within zones of strong clay replacement surrounded by patches of quartz flooding. True thickness of the mineralization is expected to be 75% of the intersection length given the drill hole's azimuth and dip of 154 degrees and -81 degrees, respectively. The two holes designed to test for extensions down-dip of Huskie, WAT18-473 and WAT18-474, intersected the targeted structure but no significant mineralization was encountered. 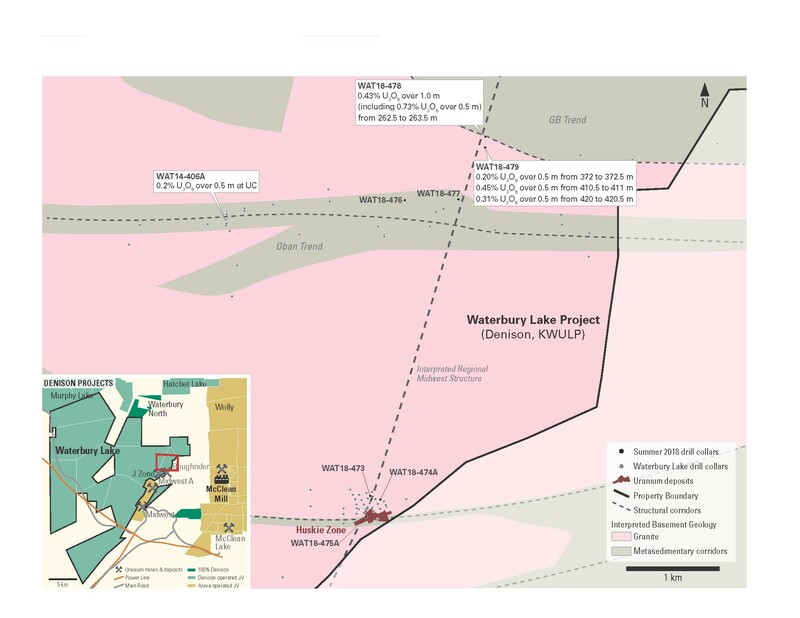 Current interpretation suggests the Midwest structure, which hosts the Midwest Main and Midwest A deposits on the Midwest property (25.17% Denison owned), may extend onto the Waterbury Lake property to the southwest of the Midwest Main deposit. An initial DCIP resistivity survey is planned for mid-September to map the possible extension of the Midwest structure and to define possible drill targets for future testing. 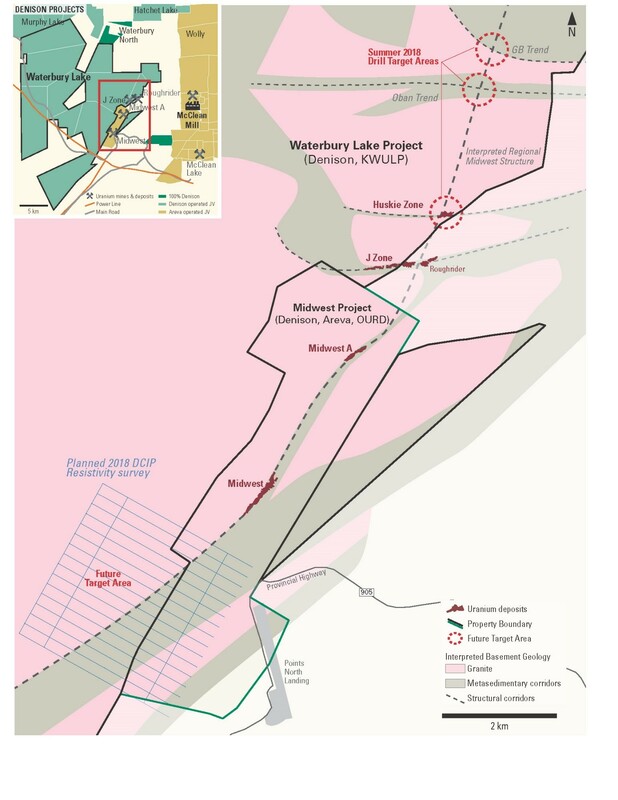 The Waterbury Lake property consists of multiple claims covering 40,256 hectares, and is located in the infrastructure rich eastern portion of the Athabasca Basin region in northern Saskatchewan. The property is jointly owned by Denison (65.45%) and Korea Waterbury Uranium Limited Partnership ("KWULP") (34.55%) through the Waterbury Lake Uranium Limited Partnership ("WLULP"). KWULP consists of a consortium of investors in which Korea Hydro & Nuclear Power ("KHNP") holds a majority position. KWULP has elected not to fund the 2018 exploration program and, as a result, will incur dilution of its ownership interest in the WLULP. KHNP is also a significant shareholder in Denison, holding 58,284,000 common shares of Denison, which represents approximately 10.42% of the Company's issued and outstanding common shares. Drill core with anomalous total gamma radioactivity (>500 counts per second using a RS-120 or RS-125 scintillometer) was sampled over 0.5 metre intervals. Sampling is undertaken on site by splitting the core in half, with one half submitted for analysis and the other half retained in the core box for future reference. Uranium chemical assays are performed by the Saskatchewan Research Council ("SRC") Geoanalytical Laboratories located in Saskatoon. Sample preparation involves crushing and pulverizing core samples to 90% passing -106 microns. Splits of the resultant pulps are initially submitted for multi-element ICP-MS analysis following partial (HNO3:HCl) and total (HF:HNO3:HClO4) digestions. Samples with ≥ 1,000 ppm U (partial digest) are re-assayed for U3O8 using an ISO/IEC 17025:2005 accredited method for the determination of U3O8 weight %. Pulp splits are digested using aqua-regia and the solution analyzed for U3O8 weight % using ICP-OES. In addition to internal checks by SRC Geoanalytical Laboratories, the Company has rigorous quality assurance and quality control ("QAQC") procedures including the insertion of standard reference materials, blanks and field duplicates. The assay data is subject to verification procedures by qualified persons employed by Denison prior to disclosure. For further details on the assay, QAQC and data verification procedures please see Denison's Annual Information Form dated March 27, 2018 filed under the Company's profile on SEDAR (www.sedar.com). Denison is a uranium exploration and development company with interests focused in the Athabasca Basin region of northern Saskatchewan, Canada. In addition to its 63.3% owned Wheeler River project, which ranks as the largest undeveloped high-grade uranium project in the infrastructure rich eastern portion of the Athabasca Basin region, Denison's Athabasca Basin exploration portfolio consists of numerous projects covering approximately 320,000 hectares. Denison's interests in Athabasca Basin also include a 22.5% ownership interest in the McClean Lake joint venture ("MLJV"), which includes several uranium deposits and the McClean Lake uranium mill, which is currently processing ore from the Cigar Lake mine under a toll milling agreement, plus a 25.17% interest in the Midwest and Midwest A deposits, and a 65.45% interest in the J Zone deposit and Huskie discovery on the Waterbury Lake property. Each of Midwest, Midwest A, J Zone and Huskie are located within 20 kilometres of the McClean Lake mill. Generally, these forward-looking statements can be identified by the use of forward-looking terminology such as "plans", "expects", "budget", "scheduled", "estimates", "forecasts", "intends", "anticipates", or "believes", or the negatives and/or variations of such words and phrases, or state that certain actions, events or results "may", "could", "would", "might" or "will be taken", "occur", "be achieved" or "has the potential to". In particular, this press release contains forward-looking information pertaining to the following: exploration (including drilling) and evaluation interpretations, activities, plans and objectives, and Denison's percentage in its properties and its plans and agreements with its joint venture partners, as applicable.